Through a broad range of traditional and experimental styles, “QI4” explores the important contributions being made to the art world from the most diverse county in the nation. A mass of people packed into every corner of the Queens Museum of Art last Saturday night for the opening of “Queens International 4” (QI4), a biennial featuring 42 artists who live and/or work in Queens. Visitors strained to hear the co-curators José Ruiz and Erin Sickler give a guided tour of works by artists including Alejandro Diaz and Kymia Nawabi, and later in the evening, for a good view of the BMX bikers performing Fast Forward, a “rhythm section” of ramps, half and quarter-pipes by Ryan Humphrey. Still others crowded at the bar to get a drink, at times personally served by QMA Executive Director, Tom Finkelpearl, who was spotted pumping the keg like a pro. Artists mingled with the crowds, which included a good dose of Manhattan gallery people and art world hangers-on who made the trek into Queens despite the non-working 7 train. It was a great turnout for the museum, which struggles with its location in Flushing Meadows Park, probably its biggest challenge. Through a broad range of traditional and experimental styles, “QI4” explores the important contributions being made to the art world from the most diverse county in the nation: Queens. The exhibit is a strong effort by a museum not known for its contemporary art collection or programs. While the presentation may lack a bit in polish, the atmosphere is welcoming, and this lack of pretension is probably what led to the obvious willingness on the part of the curators to try a new approach and keep an open mind. Risks are taken, some more successful than others, and important issues like politics, war, cultural identity, and the environment are addressed through painting, photography, sculpture, video and performance. 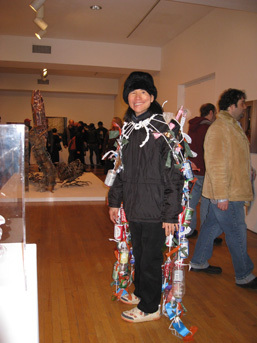 Upon arriving at the opening, guests were greeted outside by artist Chin Chih Yang, who set the tone for the evening, wearing a cape made of found items called Human Sculpture. He also pushed a cart of recyclables that projected a video piece, Queens Museum 2066, against the museum’s exterior walls. Visitors were encouraged to attach more trash to his body, creating a suit of armor. Yang’s work, which comments on society’s excessive lifestyle, and its effects on our surroundings, continued inside where he used brightly colored lights and another video piece to metaphorically, and literally, illuminate dark corners. 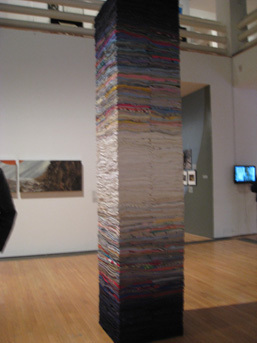 Derick Melander’s Flesh of My Flesh, a sculpture of secondhand clothing stacked in color value starting and ending with dark hues, not only addresses the idea of re-use, but is a site-specific tower of portraits, each “hand-sewn repair or name inside a collar” revealing “an intimate record of our physical existence”. This piece commands attention, and is placed center stage in the first gallery, somewhat minimizing the surrounding pieces. It was exhibited at last year’s Scope Miami, and while a visually non-offensive work, it lacks in strength and doesn’t quite elicit an emotive reaction. His is an ongoing project, however; visitors are encouraged to leave their own clothing donations in a customized Goodwill bin for use in a future collaborative project that sounds more interesting and layered, pardon the pun, than the sculpture. Other highlights include Tim Thyzel, who uses everyday objects to create sculptures of banal items such as road blocks, canoes or life boats. Packing tape and bubble wrap lend these sculptures functionality; a road block becomes a bench, bubble wrap becomes a boat. Accompanying photographs depict how the items can be turned into practical items for everyday life. Construction workers rest on the benches, the artist relaxes on a hand trolley-seat in a local park. Thyzel’s bubble wrap, packing tape boat will be launched on Meadows Lake in Flushing Meadows Corona Park on April 4th. Like, A Conversation by the English artist Karolyn Hatton, is a series of fabric and wood banners hung from the ceiling. Hatton, who was surprised to hear the “figures of non-speech” in the lexicon of Americans when she moved to Queens from London, creates banners that use these filler words that interrupt our sentences much as the artwork interrupts the physical space. Installed in a group, Like, A Conversation creates a sort of sentence itself. The banners are simple and almost cartoonish, but then, so is the language it is representing. Justine Reyes honors her uncle, who raised her from the age of two, in a series of touching photographs called Guayabera Series. 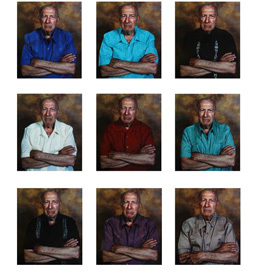 These large-scale, color photographs, which differ only in shirt color and the man’s expression, deal with issues of identity, history and time, and the artist’s “investment in objects of emotional value”. Viewers are drawn into the obviously close relationship between subject and photographer, clear in the ease of his demeanor, which lacks any fear or hesitation. One is struck by the slight changes in expression, and wonders at what might have transpired between the two to adjust the mood. For more info on performances, film screenings, studio visits, workshops and other programs accompanying the exhibition, visit the museum’s website.